Twin brothers, Terry and Perry Bullinger are fresh uke builders from Oregon. They handmake ukes part time known as Covered Bridge. Terry sent this tenor over last week and we’ll give it a quick review and sound sample. See what you think. Myrtle has been used by well known guitar makers for many years. Also known as Oregon Myrtle, Laurel and Bay Laurel, this wood almost reminds us of a rare Koa wood known as “white Koa” with similar grain patterns and blond to light brown colors. Also, as with Koa, each piece is unique, with different colors and grain patterns. Exceptional bass, treble, and projection, Myrtle combines qualities of Rosewood, Mahogany, and Maple. In other words, it’s considered by some to be one of the best tone woods for stringed instruments. 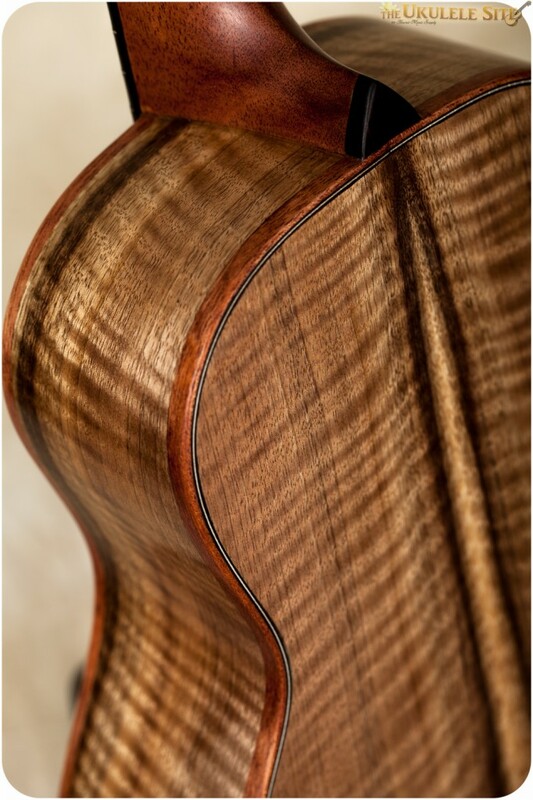 This ukulele features the highest grade Myrtle wood. Sumptuous greens and dark greys, curling in radiant symmetry. Along with that, it’s rich brown cedar top and koa wood accents are complimented with an oil varnish finish for a natural woodsy vibe that I love. Light and balanced in weight, like many prefer, and with a feel right out of the box that would serve any level player. The tone on this uke is sharp without being strident. It really has a nice ring, great for jangly strumming or articulated fingerpicking. I would say it’s in the realm of a DaSilva type sound. Meticulous attention to detail is not quite at a high end custom level, but this is half the price (or less) than the equivalent models from the more established custom builders and still very nice. So in all regards I would rate this Covered Bridge tenor as a great value. They are fairly new and I’m interested to see more from Terry and Perry, twin uke makers. Covered Bridge Ukulele, check it out. Covered Bridge ukuleles are mag(ic)nificent! Never cease to amaze. Ah, a lovely Oregonian. Cool. The sound of this ukulele makes me want to be in Hawaii! One word for the person playing the ukulele, flawless. What a beautiful ukulele! I’m the proud owner of a Covered Bridge myrtle and redwood concert and love it to bits. Perry and Terry sure make some stellar instruments! This uke sounds perfect! Hope they have more from Covered Bridge when I go to visit. I also recently purchased a concert uke from covered bridge. It plays great. I agree with the author of the article above about the need for a little more attention to detail. For example the markers on the fretboard are not aligned evenly. The cuts on the nut is a little uneven between the G and E string. That might not be their fault if already purchased that way. The neck is a little heavier than some of my other Ike’s. Anyway, I am very picky and for the price of thei Ike’s given the high quality of woods and the sound of these instruments combined with the cost make them a great value. I think anyone would love have one of these non-massed produced instruments. You can tell it is a one of a kind uke that you own.